We love our ice cream. We love really GOOD ice cream, not the cheap stuff full of additives. Since we love our ice cream so much, we decided to make our own. As with most things, making our favorite foods at home allows us to use organic ingredients, make sure there are no additives, keep the cost down and make whatever flavors we choose! Tonight (on my 50th birthday) we are having a houseguest (a childhood friend of our daughter) and she loves my homemade ice cream. I made her favorite – chocolate. And it’s SO easy with our handy dandy ice cream maker. Check this out! You mix up the ingredients in a bowl (takes about 5 minutes). Pour it into the freezer bowl. 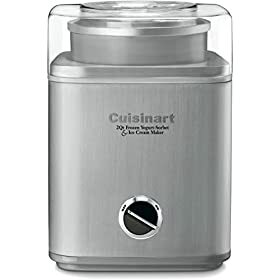 Place the freezer bowl onto the machine and turn to “ON.” In 25 minutes, delicious, creamy soft-serve ice cream is ready! if you want the texture to be firmer, freeze the ice cream in a container before serving. Any add-ins such as crumbled cookies, peanut butter, fresh fruit, chocolate chips.